You may get retainers with or without orthodontic treatment. Teeth may move at any time in life due to various reasons and in most cases this is normal. You want to make sure your teeth don’t move, or adjust their alignment slightly if they have already moved. If there is major correction desired, a retainer is not the right choice for you. Make sure your expectations from a retainer are realistic before ordering one! Retainers can be glued to the back of your teeth. They will be hidden with your smile and people around you won’t know you have them unless inspecting your mouth. They are tolerable to almost everyone and it will keep your front teeth straight with confidence. You won’t have to remember to wear them every night. However, just like anything else they need to be maintained. That means spending more time cleaning and flossing underneath them daily. Retainers may break and need to be repaired immediately to avoid any problems. If you already have a fixed wire retainer but it is broken partially or completely, it may or may not be able to be repaired. If it cannot be repaired or you choose not to repair it, you will have the options of a new fixed wire retainer or a new removable retainer. 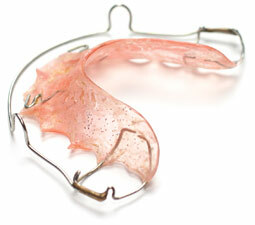 Removable retainers need to be worn full time or at night time only. They are easy to clean but visible when you smile and speak. Learning to speak with them may be a challenge. They can be designed in all clear plastic, similar to Invisalign, which is less visible or with a metal bar in front. Removable retainers are sometimes used in addition to the fixed wire retainers to reassure stability of both front and back teeth. The design with metal is the only option that is adjustable and may help your teeth move to a better position. Only minor and simple tooth movements can successfully be achieved with retainers. A night guard can serve as your removable retainer. If you need to use a night guard, it will keep your teeth in place as well. You may consider a retainer for the arch opposing the night guard. Please remember, retainers are for life! Our bodies are always growing and our teeth are always adapting to the changing environment around them. They will move without your retainers.